"Machine Gun" Jack McGurn rises from amateur boxer to second in command of Al Capone's criminal empire. One of Hollywood’s favorite genres, the “mobster flick” gets another outing via 2017’s Gangster Land. Set in Chicago circa the 1920s, boxer “Machine Gun” Jack McGurn (Sean Faris) joins the Mafia after the murder of his stepfather (Tom Noga). 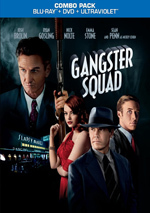 As he goes through the ranks, McGurn befriends another up-and-coming gangster: Al Capone (Milo Gibson). We follow Capone’s rise to power and McGurn’s role in these affairs. Haven’t we gotten enough versions of the Capone story? These go back at least as far as the fictionalized version of 1932’s Scarface and we’ve seen umpteen more takes over the decade, with the best-known recent incarnation probably coming via the HBO series Boardwalk Empire. Granted, the use of McGurn as the lead gives this narrative a different twist – in theory, at least. In reality, Land relies on every cliché it can find and fails to deliver anything even vaguely new. Honestly, Land often feels like parody. It delves into all the genre tropes with such abandon that I occasionally wonder if the filmmakers intended it as a spoof. This means not a damned thing about Land comes across as fresh, different or new, and the performances feel stripped out of a Saturday Night Live skit. Irish characters sound really Irish. Italians come across as really Italian. And then there’s Peter Facinelli’s odd turn as Bugs Moran. It feels like he brings an impersonation of Christian Slater doing an impersonation of Jack Nicholson, choices that stand out as weird even in this strange melange of genre clichés. Add to that a score that blatantly borrows from 1987’s Untouchables and Gangster Land turns into a complete waste of time. Even as overdone as genre may be, it can still provide entertainment, but this one delivers so little creativity, depth or drama that it becomes a flop. Gangster Land appears in an aspect ratio of approximately 2.40:1 on this Blu-ray Disc. The movie came with a quality presentation. Overall sharpness seemed strong. Only a little softness emerged, so the flick was usually accurate and detailed. Colors tended toward orange and/or teal, with a bent toward the blue side of the street. Within those parameters, the hues were positive. As for the DTS-HD MA 5.1 soundtrack of Gangster Land, it came with moderate ambition. The soundfield focused on music and ambience, though it opened up on occasion. For instance, violent scenes became a little more involving, and some street/bar segments enjoyed a good sense of place. None of these dazzled, but they added to the overall impact. Music offered good clarity and range, and effects worked well enough, with clean highs and warm lows. The track never became rock-em sock-em, but the mix suited the material. The disc opens with an ad for Hickok. No trailer for Gangster Land - or any other extras – appear here. 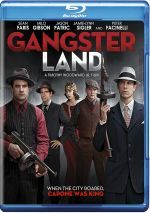 Oddly overwrought and bogged down by one cliché after another, Gangster Land becomes a feeble genre effort. It feels more like a parody than a serious attempt at drama. The Blu-ray boasts largely positive picture and audio but it lacks supplements. Gangster Land winds up as a borderline embarrassing effort.